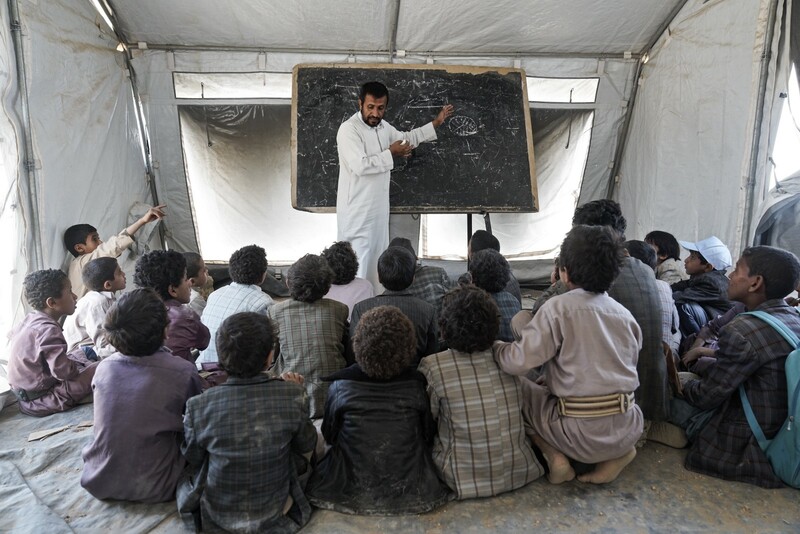 Almost two dozen schools throughout impoverished Yemen have now been occupied by armed groups, and another 1500 have been either partially or totally destroyed by the relentless fighting. Around 1800 children have been recruited into the armed conflict. Almost 1700 have been killed. And now, even newborn babies are being put at risk. For children caught in the middle of this conflict, even going to school can prove deadly, with 222 attacks on schools over the last two years. Two years into Yemen’s brutal conflict, and the daily existence for children has become particularly tough. Around 1800 children have been recruited into the armed conflict. Almost 1700 have been killed. And now, even newborn babies are being put at risk. At Alsabeen Hospital, we find six-week old premature baby twins being administered oxygen as they are held by their parents. Despite being born premature, the babies were in an incubator for only three days after birth, due to a shortage of incubators. The twins each weigh a little over two kilograms. Despite being born premature, the babies were in an incubator for only three days after birth, due to a shortage of incubators. 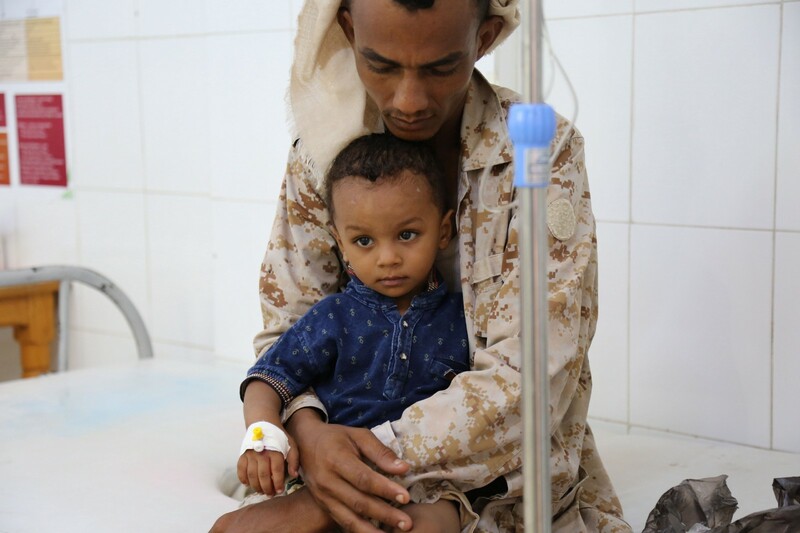 It is another example of the terrible impact the fighting is having on Yemen’s most vulnerable citizens. Those who have so far survived the fighting are often forced onto the streets to find any money or food they can. Fourteen-year-old Ashwaq has eight brothers and sisters. Together they fled their home in Sadaa, and now live in the Khamir settlement with others who have fled. “We beg to eat. I would like to go back to Saada one day where everything was easier. 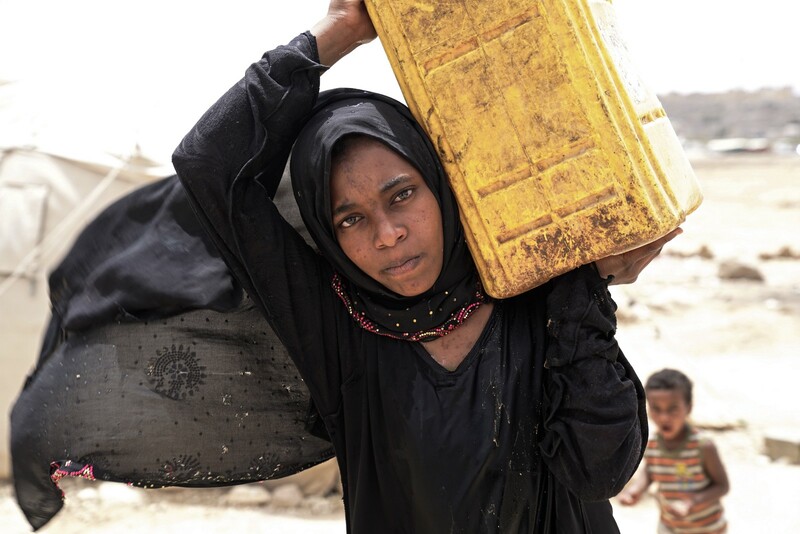 21 million people estimated to be in need of assistance and protection throughout Yemen, and increasing tensions and hostilities have left over 50,000 people displaced. Throughout the country, families live in tents or shelters wherever they can find safety. But that doesn’t mean they can find much else. Ayoub Ali, his wife Juma’a, and their four children escaped the fighting in their village, but now they are alone among a sea of fellow refugees. With no money, and no income, Ayoub struggles to feed his family on a daily basis, and is forced to beg in a nearby town. Their makeshift shelter is filthy, and the families blankets barely cover the stony ground it is built on. Within the shelter is everything they own. 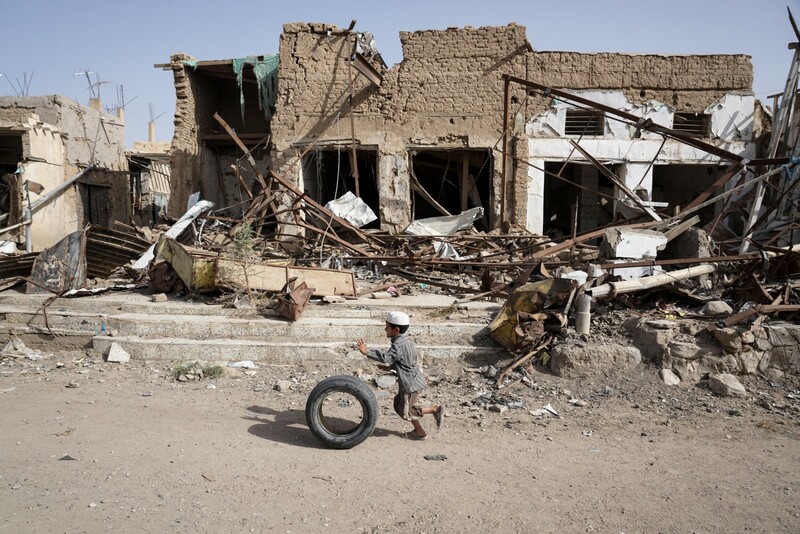 The children are forced to play among destroyed buildings, finding some semblance of childhood wherever they can. They are among the 21 million people estimated to be in need of assistance and protection throughout Yemen, and increasing tensions and hostilities have left over 50,000 people displaced. Yemen’s education system is on the brink of collapse, and more than 5 million children risk being deprived of their right to education. Almost 200,000 teachers have not been paid for the past nine months. Where possible, students now attend school in UNICEF tents. While they provide a safe space for children, more work is underway to ensure that their homes and communities are also safe. Water and sanitation services are barely functioning in most parts of the country, and most Yemenis haven’t received water in their taps or electricity in their homes for over two years. Thousands of volunteers are trying to curb outbreaks of cholera and diarrhoea, which have infected half a million people and caused 2000 deaths in the last four months alone. Garbage is lying on the streets and stagnant water is collecting in residential areas — creating perfect conditions for a public health crisis. Defying the heat, humidity and high winds, thousands of volunteers are trying to curb outbreaks of cholera and diarrhoea, which have infected half a million people and caused 2000 deaths in the last four months alone. Muhtab Alburaik Salem is one of those volunteers. She and her two colleagues are visiting each and every household in this community, knocking until those inside open their doors, and telling families how to prevent their children from dying. These diseases are preventable so what I do is spread awareness among the most vulnerable communities on how to prevent it, or how to react if they have somebody infected in the family,” she says. Thousands more, mostly living in unclean and unhygienic areas, are reporting sick on a daily basis. Many of them are displaced from their homes as a result of the two and a half years of conflict that has taken thousands of lives and destroyed homes. Organisations such as UNICEF are already saving lives. Millions of people have been provided with life-saving aid, and millions more will are receiving assistance as the fighting continues to disrupt lives — both young and old. UNICEF is winning battles, but there are many more to come before the war against disease and death can be won. With no end in sight to this crisis that has plagued the Middle East’s poorest nation, outbreaks of disease are only likely to increase if basic social services such as health, water and sanitation are not urgently and fully restored. That can only be achieved through continued funding, and generous donations from those of us who can only watch on in horror. 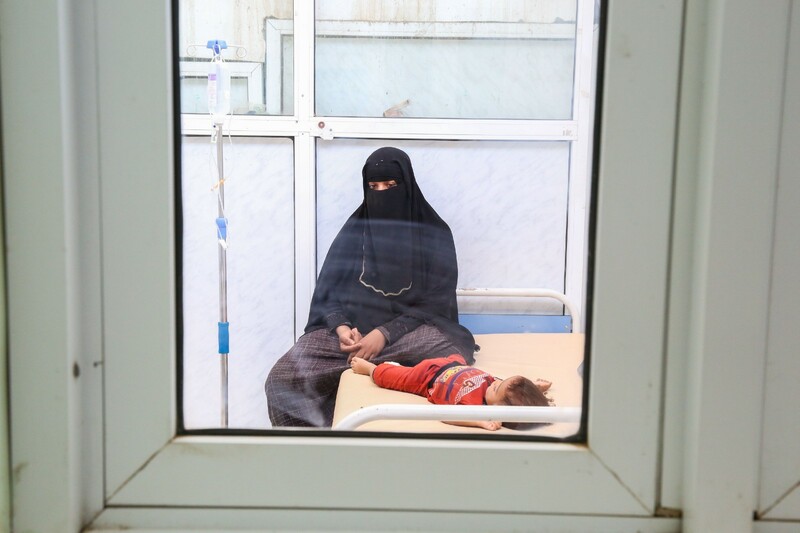 Until that happens, Yemen’s children must continue to dodge disease, and bullets alike.